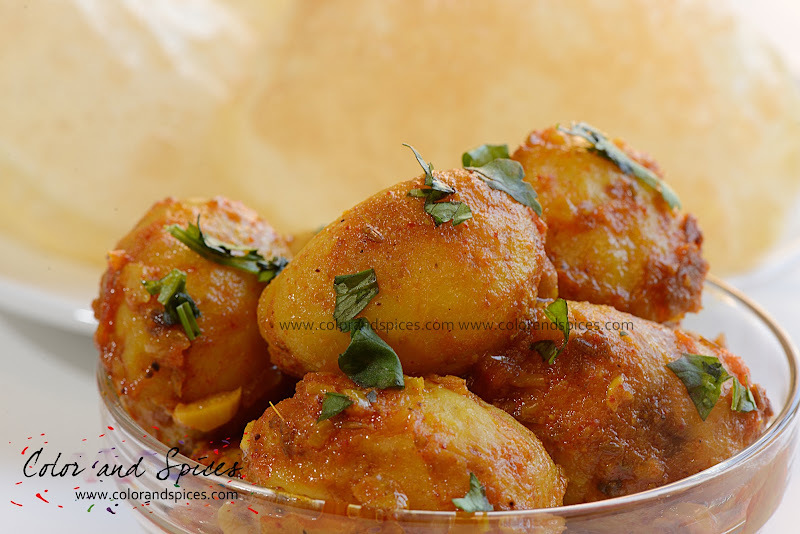 Alur dum, as the name suggests it is slow cooked potatoes. This is my second alur dum post. The previous one I posted was a vegetarian version, that is without onion and garlic. Yes, we Indians consider onion and garlic as non-vegetarian items. 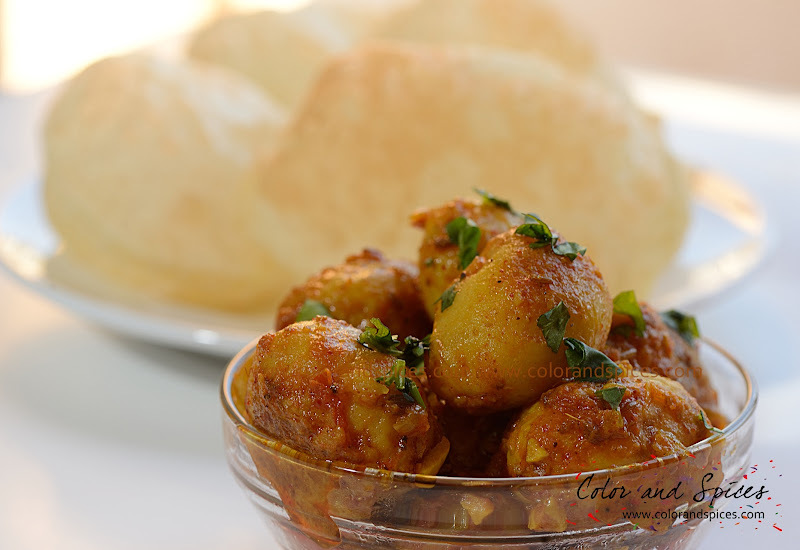 I prepared this dum alu or alur dum with baby potatoes, which are a winter must have. The taste of the baby potatoes make it special. But you can always make it with large potatoes, cut them into quarters. I had this with luchi, fried puff breads. This can also be very well paired with koarisutir kochuri, green pea stuffed fried flat breads. 1. Wash the baby potatoes well and prick them with a fork. Boil them with some salt, till half done. I used a pressure cooker. If using a pressure cooker, then cook the potatoes for one whistle, remove from heat. Wait till pressure releases. Drain the potatoes and dip them in cold water. Peel the potatoes and keep aside. 2. In a deep pan heat oil. I used mustard oil, you can use any other vegetable oil of your choice. As the oil is hot add the half done potatoes and fry them over high heat, till the surface turns red-brown. Take out the potatoes and keep aside. In the same oil add the whole spices(cumin seeds, cardamom, cinnamon, cloves), cook till the spices release a nice aroma. 3. Add minced onion and a teaspoon full of sugar. Cook till the onions are golden brown. Keep stirring for even color and take care not to burn the onions. Add the garlic. Cook for 1-2 min. Add ginger, cook for another 2 mins. Add chopped tomatoes, sprinkle salt, cover the pan and cook till tomatoes are done. 4. Add turmeric powder, cumin powder, red chili powder, kashmiri red chili powder, mix well and cook till oil separates from the spices. 5. Add the potatoes and 1/4 cup warm water. Reduce heat to low, cover the pan and cook till the potatoes are done. 6. Check seasoning and adjust accordingly. Add green chilies(if using). Sprinkle garam masala powder and chopped fresh coriander leaves. 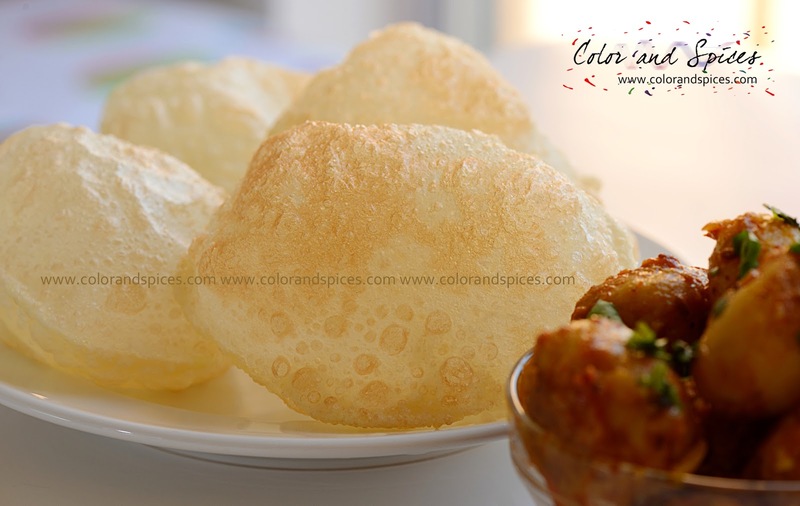 Serve with luchi(fried puff bread), kochuri(stuffed and fried puff bread) or rotis.